Who doesn’t!? It’s an excuse to dress up and have fun. 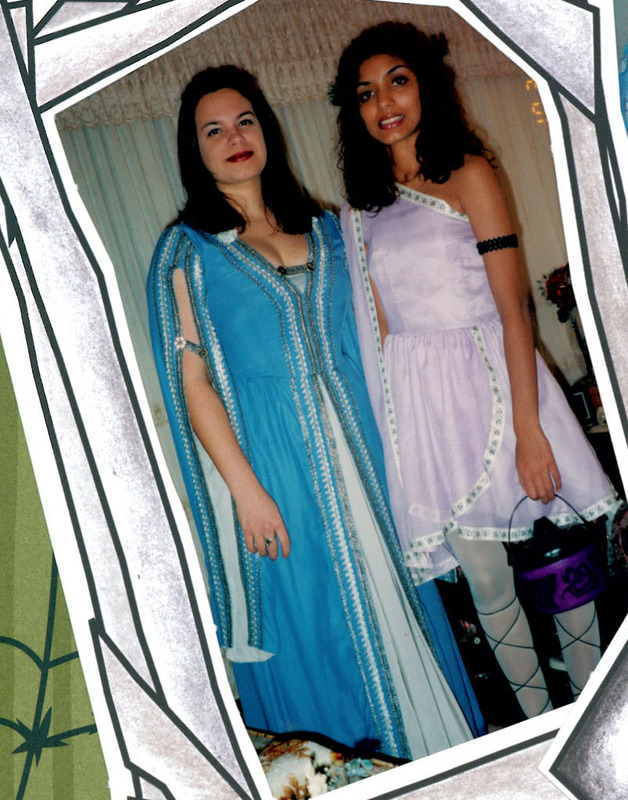 As a kid we would go to my grandparent’s house, and go trick-or-treating there (as we lived in a condo and weren’t allowed to go door to door). After our bags were filled to the brim with treats of all kinds, we would go back to my grandparent’s house and celebrate my Nonno and Aunt’s birthday…which meant cake! 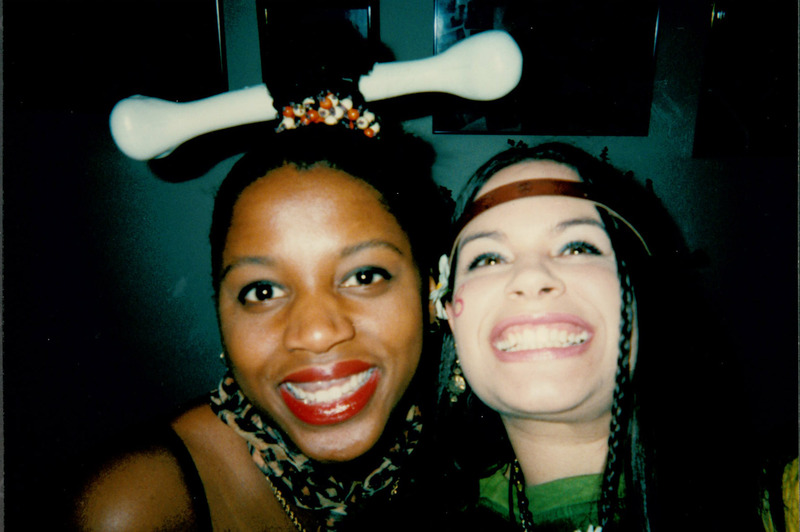 As I got older, I stopped going over and started going to Halloween parties, at night clubs and banquet halls. 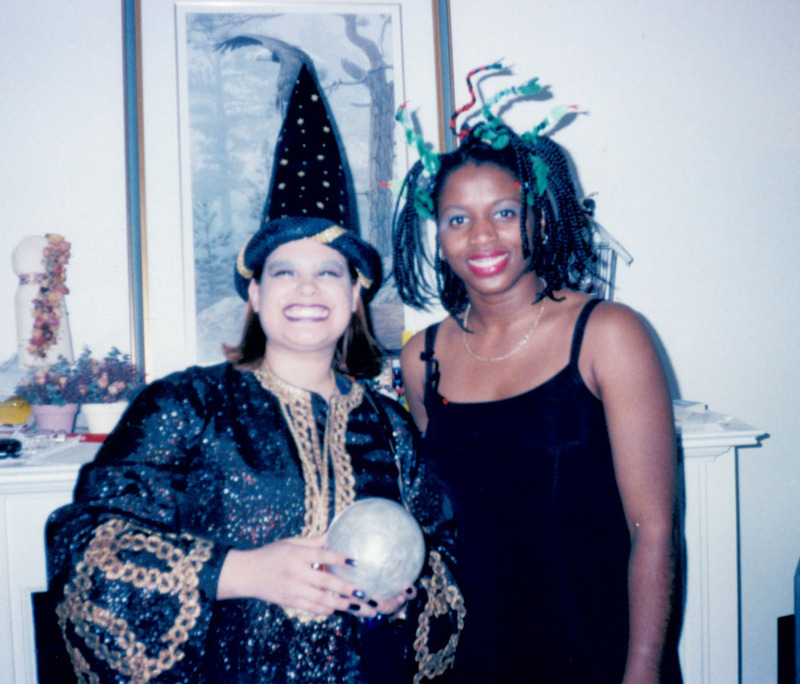 Costumes were serious business and I would start months in advance trying to nail down the perfect idea. 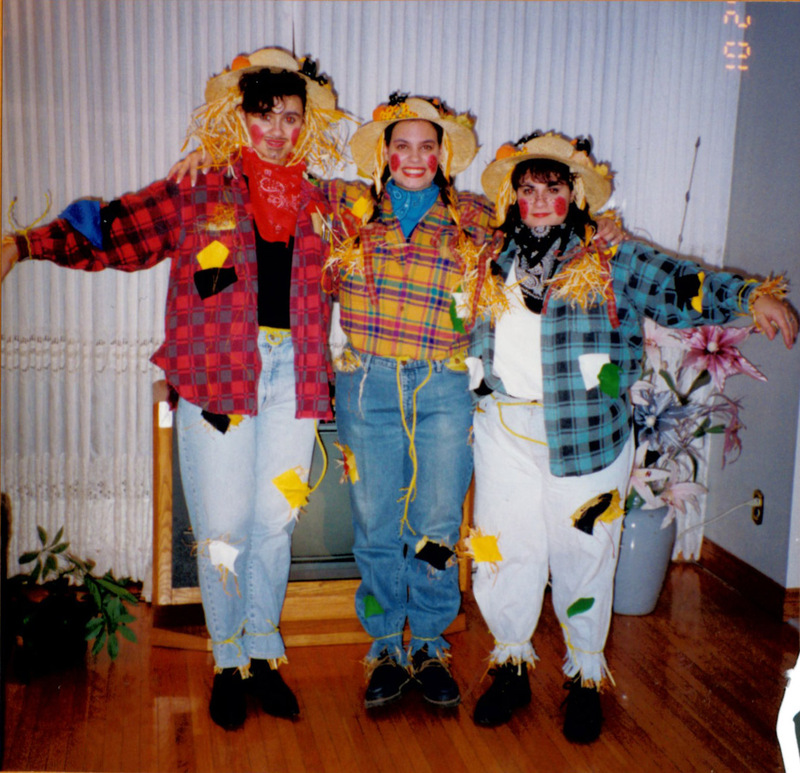 I once went with my two friends as a Scarecrow Family (Ma Crow, Pa Crow and Lil’ Crow). We came in 4th place in a contest wearing these costumes! 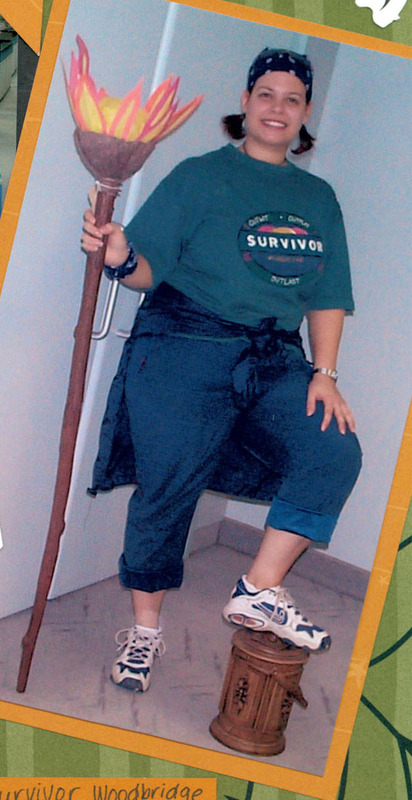 My friends and I have gone as various characters, over the years, such as a Hippy, Pebbles, Nuns, Wizards/Fortune Tellers, Medusa, Medieval Maidens, Greek Goddesses, Victorian Lady’s and one of my faves was when I dressed up as a contestant from Survivor. 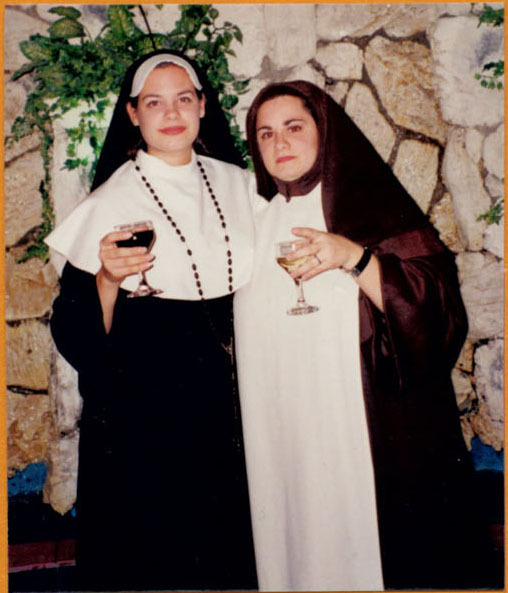 Two nuns drinking Holy wine! Soon after, I felt too old to go out and celebrate, so I started to stay home and give out the candy. When I had kids of my own, I would keep my eyes peeled in the late summer, early fall for when the stores would put out their costumes and have first pick at the options for my Little Bird and Little Mouse. They have been flowers, bumble bees, monkeys and princesses. This year I have Princess (Belle) and a Pirate (arrr!) They can’t wait! 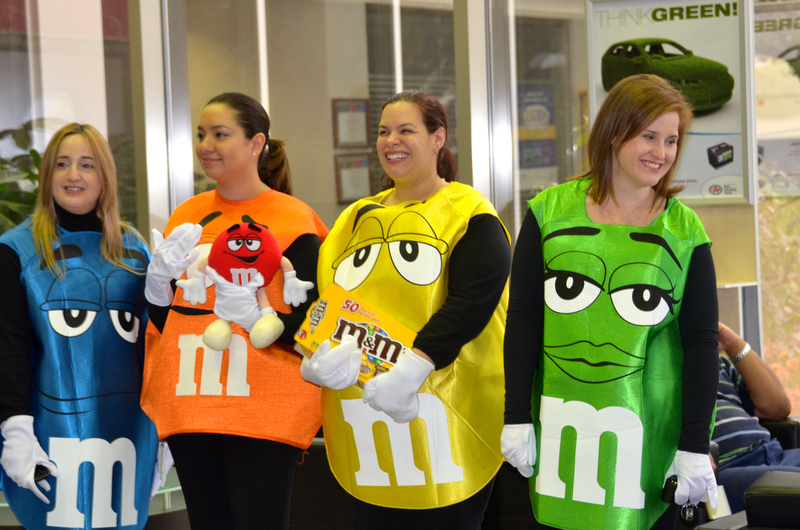 I still like to dress up, however, and in the past few years have toned it down and have gone as a baker (pregnant with my Little Mouse), a Pimp and an M&M – the Yellow One! It was hard to decide what to wear this year. Have you been to the costume shops?! Every option is short, tight and barely leaves anything to the imagination. Hardly suited for work, let alone trick-or-treating with the kids. So this year, I’ll be, like, going as a valley girl! A homemade costume, complete with fushia pink lipstick, legwarmers and a Flashdance inspired cut sweatshirt! Whatever your costume, I hope everyone has a sweet day tomorrow!